That moment has stuck with me through this year as we have once again navigated our way through the twists and turns that are thrown at us as businesses offering services within the NDIS. Yet here we are still are! Businesses trying to navigate the NDIS are among the most resilient of all. So to welcome in another year – I took a look back through our closed Facebook page – the Disability Community of Practice Australia where so many of us find the support that we need to keep going. Thank you to one and all who contribute to this page, I didn’t realise how busy it is until I spent a few hours going over a year’s worth of posts. My goodness, so many posts about whether people funded against the Early Intervention line could continue to self or plan manage. It seems that information about this is not always consistent from the ECEI Planning partners and then was further confused for people in South Australia and NSW with the introduction of the NDIS Commission and new provider registration requirements. The bottom line is that families who are funded against the Early Intervention item can absolutely self or plan manage their funds as long as they meet the standard criteria that is applied to everyone. If anyone is told anything different from a representative of the NDIA – please pass it along so that we can make sure that it is cleared up. The 2018 – 2019 price guide brought a few changes – the highest impact went to the changes made to the way travel could be billed. The rules for support workers and therapists were brought into line with a 20 minute limit of claimable time between clients with exceptions for those living in areas deemed to be MM4 or MM5 regions where 45 minutes can be claimed. Confusion continues about whether this can be charged ‘each way’ if only a single visit is being completed and there is no answer for those people seeking home or community based services who live far beyond the 20 or 45 minute radius and have no Provider options any closer. Or perhaps they want to exercise their right to choice and control and use the support that’s best for them rather than who is the closest. While there is a narrative persisting implying that providers are being somewhat greedy requiring reimbursement for travel the reality is that for businesses to maintain viability they simply cannot continue absorb the loss of time spent in the car on an ongoing basis. Let’s not forget the changes that were made by the Agency to plans to account for price increases (that didn’t always make sense) and the automatic service booking changes which created more admin headaches for everyone. I could hardly believe that my initial posts about the campaign to push the need for NDIS to continue to fund swallowing assessment and support went as far back as February! This was my first experience with a highly structured, organised and targeted campaign and it reinforced my view that ADVOCACY GROUPS NEED TO BE CONTINUOUSLY FUNDED! The Council for Intellectual Disability know what they are doing with this stuff – and I would highly recommend that anyone supporting people with ID join up which will help them maintain their core business with their funding being on shaky ground. Huge shout out to Jim Simpson and Rochelle Porteous who were the rock stars behind the effort. Support crew included Dr Bronwyn Hemsley from UTS and Pip Cullen (OT and business owner) who connected us with families who played a pivotal role in raising the issue with the public. We were also well supported by the Sydney Morning Herald and The Guardian. Thanks to everyone who signed the petition. The NDIS / Health issue was also progressed through an AAT decision regarding support for a person with insulin dependent diabetes. We are creeping slowly towards a place where there is a sense of agreement with COAG and the states and we can only hope that this speeds up as more people find themselves stuck in the middle with Planners and LACs making guesses on what is OK to be funded under the Scheme. The initial transitional arrangements for ECEI finished up in June 2018 and the new ECEI partners for NSW were eventually announced. It seems it took at least 2 months (if not a little longer) for the switch over to be completed and reports of children waiting extended periods for assessments and plans have been emerging. The former partners are now engaged in their own reorganisation to be able to continue as viable businesses within the Scheme. Lots and lots of posts in our past years feed about people receiving 3 month plans. Whether this was to do with the new ASD eligibility criteria, the group of kids moving out of early childhood or some other mysterious reason it played havoc with administrative processes for businesses. Many businesses were caught out with plan reviews being called early with limited time for review reports to be supplied in time and unspent funds in old plans. This must affect the NDIA data on unspent funds and it brings forward the administrative burden to business including new service agreements and service bookings and completing any un-invoiced claims through the old plan. It does make it more challenging for businesses to try and predict the ebb and flow of their workload which can domino to planning staff leave etc. I think we’re at ‘assume a plan review could happen within three months of the end date’ territory. My goodness so many posts about issues with AT – the process, the lengthy waiting time for approval, the times that a piece of equipment arrived sans an essential part because someone along the convoluted approval route decided it constituted a ‘restrictive practice’ and neglected to contact the person prescribing the equipment for more information. A new system is being rolled out and it remains to be seen whether this will streamline the process. Personally I have just been asked for quotes for a communication device for a 2 year old at the beginning of a new plan because I flagged it as a possibility over the next year. I have completed no trials and I probably wouldn’t have for at least 6 months. I haven’t resolved what I’m going to do about this one yet! I think no one was delighted with this decision, and while it seems to be true that calls are answered more quickly the jury is still out as to whether information provided is any more accurate. Well wasn’t this a smack in the face for the allied health sector! I attended one of the consulting sessions and have to admit I did not see this coming. A recommendation for the introduction of tiered pricing based on complexity with a 40% cut from the current rate for the less complex group. There was also a push to fund more Allied Health Assistants rather than a qualified therapist. There was no mention about how LACs and Planners would be trained to be able to identify complexity and according to the NDIA response they would be implementing the changes in just a few months. Good bye budgets, business plans and forecasts for businesses. The comparison data used to justify the cuts was based on populations which bear little to no resemblance to people who are eligible for the NDIS. Clearly the NDIA are looking to reduce the spend on this item. There is frequently online discussion about the therapy rate being high at almost $180 / hour. Personally this is what I pay my own sports physio privately and seems to be the market rate. Following considerable backlash and thanks to a concerted and somewhat organised team effort via the professional associations the implementation of this recommendation was delayed and is undergoing a further ‘review’ over the next month with a decision to be announced in March 2019. This should give providers enough time to crunch their numbers and determine whether continuing with their NDIS registration is a viable option. Onwards to 2019 for this one. We all breathed a sigh of relief as this important announcement took place. Judging by the amount of posts from people trying to track down failed payments this continues to be an admin nightmare for businesses although at least successful uploads result in fast payment via the portal which is great. Working with some Plan Managers is presenting businesses with some challenges too and we are awaiting the development of some consistent guidelines from the Agency. The Centre for Social Impact released their report on Market Stewardship with interesting evidence for how the Agency could support the market to develop. Hmmm. The Joint Standing Committee report on the Market Readiness contained 29 recommendations. The NSW Parliamentary Inquiry into the Implementation of the NDIS provided a further 23 recommendations. The NSW Government response is here. To my mind what still remains absent in all reports and discussions is the language and content relating not just to the vague term of ‘market’ but to the specific challenges and needs of ‘business;’ which the reality for every single provider. The NSW Ombudsman’s report on Reviewable deaths revealed ongoing issues with managing swallowing and mealtimes resulting in illness and deaths by choking and respiratory complications. Thanks to the fabulous video by performer Adam Bowes, all of our frustrations made their way to the mainstream. Finally a national approach to Quality and Safeguards which was welcomed by most was introduced in July 2018 along with a brand new set of Practice Standards against which every single business providing services within the NDIS must now comply. The level of compliance required of each business is dependent on their business structure (sole trader / partnership vs company structure) and the complexity of the supports that they offer. For those requiring the higher level of compliance – preparation and cost of the eventual audit required to demonstrate compliance is extensive and expensive. There is now effectively a ‘registration fee’ to be a registered business within the NDIS. In another reminder that the government agencies are not in the mindset of businesses, an email was circulated from the Commission that among other recommendations for registering businesses to register as a sole trader rather than a company. This carries legal, tax and administrative risks and I highly recommend that any changes to business structure are to at the very minimum discuss this with your accountant. Following an initial error in uploading then quickly deleting a document relating to a tightening of ASD eligibility for the NDIS, a new national diagnostic guideline for those people with ASD was released. Congratulations! You are all amazing. I’m quite sure that I have still not managed to capture everything, so many things have happened this year that have a direct impact to business and all out of your control. I find it quite incredible that you all keep punching on. It’s true that we have lost some great people along the way and we will miss their talent and skill enormously. If we continue to support each other and use sensible evidence based business practice we will be able to continue our passionate work supporting people with disabilities and build successful businesses along the way. There has been lots of discussion over the last few days about the timelines for the completion of your NDIS audits. This morning I had a chat with the lovely people at the NDIS Commission and here is what I have for you. We are developing a Policy to Practice solution that will get you from Registration to Audit. You can register your expression of interest to find out more here. The process for renewing your registration has a series of steps. This is outlined clearly in the NDIS Commission Registration Renewal document. Basically the first thing you need to do is to log into the Commission portal. You can do this directly from the NDIS Portal. There are also instructions for using the Commission portal available here and this one includes screen shots too. This is where you will complete your online application and self – assessment. At this stage you can make any changes - remove or add support groups, change your business structure, address details etc. It makes the most sense to make these changes now because if you make significant changes after this (like adding support groups or shifting from a sole trader to a company) it can trigger another audit. NOTE: right now you are limited to 7 uploaded attachments of 2MB or less each. The Commission are VERY OK for you to write in the 300 words self assessment boxes ‘relevant documentation will be supplied directly to the auditors’. Hack: this also means that you will have more time to get your documentation completed if it’s not quite ready. Once you submit your online application and self – assessment, you will receive a Scope of Audit document which is what you provide to the auditors in order to obtain a quote. Please obtain a quote from ALL auditors as costs are varying enormously. Here is the link where you can find all approved auditors. We are collecting data about the cost of audit which is being fed back to both the NDIS Commission and the NDIA. You can lodge your audit quote information here. Once you have chosen and engaged an auditor, you will provide them with a reference number which is on your Scope of Audit document. They will use this to log into the system and connect themselves with your business. The auditors have 9 months from the expiry date on your Certificate of Registration to complete the audit and get the report back to the Commission. Once the auditors return their report, the Commission will determine suitability. You will be notified as to the outcome. Then you need to ensure that you are complying with the Practice Standards in an ongoing way until it’s time to renew your registration or undergo a surveillance audit. Remember that there are circumstances where the Commission can trigger an unscheduled audit (usually if there has been a serious incident or complaint – see the auditor rules for details here) so you want to make sure that you are engaging with your policies, systems and processes consistently. Providers who are looking to renew their registration have been sent a Registration Certificate. On that Certificate is an expiry date. You can also see this expiry date inside the NDIS Commission portal. Providers who are considering renewing their registration must START their online application by the expiry date. Renewing providers ARE NOT subject to the 60 day completion rule as new registrations are (see below) HOWEVER you must have your audit complete and the auditors must have their report back to the Commission by 9 months after that very important expiry date. Remember (from above) that you can’t get your specific quotes from the auditor until you get your Scope of Audit document from the Commission and you can’t get that until you submit your COMPLETED online application. The online application is lengthy, especially for those who are completing Certification. I suggest that you do not leave this until the last minute. If your 9 months after expiry date passes without the auditor report being received your business will be removed from the system. For those who are starting up, the process is similar but the timelines are different. The online application is completed directly from the Commission website. Once started, this MUST be completed within 60 days or the application is deleted and must be started again. Once the online application is complete, the Scope of Audit document is sent out, as per above. This is then used to gather quotes from the auditors. Again, please ask ALL auditors for quotes as they are varying enormously. There is NO timeline for new registrations to complete their audit after submitting the online application. However your registration is not complete until it’s done and therefore you can’t claim from the NDIS for any supports delivered. Once the audit is complete the report is sent to the Commission as above and from there the process is the same as renewing registrations. Having worked through the process with a few people now, here is my take. VERIFICATION: The self assessment is against 4 limited outcomes of the Practice Standards only. Documents still need to be supplied against each of these units however given we know now that these can be supplied directly to the auditor at a later date it is not essential that they are completed at the time the of the online application, although the application process kind of informs the content of your documentation. New registrations may need some support to understand the language and the landscape, so don’t hesitate to be in touch via the contact option on my page. Allow between 2 and 12 hours for the online application plus the time to develop relevant documentation. CERTIFICATION: The self assessment will vary depending on any additional high risk groups. The Core part of the application is against 24 outcomes of the Practice Standards. The volume within the high risk modules varies. Depending on how much detail you want to go into in the 300 word boxes this application can take some time. The evidence trail you need to have in place to show an auditor that you are working to the Standards is significant and will vary depending on how much you already have in place and the complexity of the supports that your business offers. I would allow 10 - 20 solid hours for the online application and if you blitz it in less time then happy days :). I will add a link to this information to the FAQ’s page. If Specialist Disability Accommodation is not for Cayt - then who on Earth is it for? Cayt is a girlfriend of mine who I have known for many years. She is a smart, feisty and funny thirty - something who is completing her degree in Social Work. Cayt also has cerebral palsy which affects every aspect of her life. This means that to be as independent as possible she also requires as much support as possible. 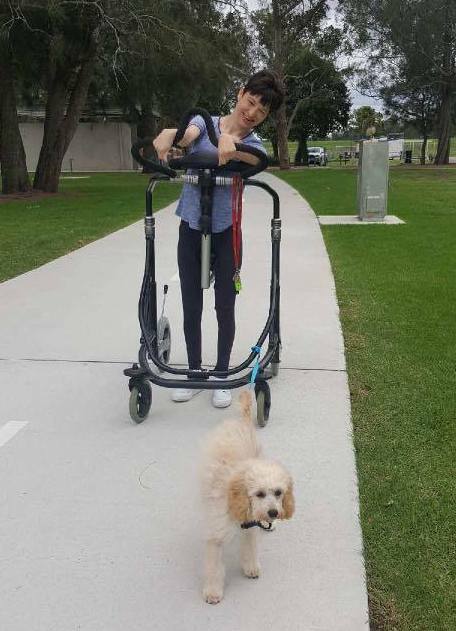 While she is standing in the pic, she actually uses a powered wheelchair for mobility and a voice output device for communication. Through hard work and commitment she has already achieved more than most able-bodied people. Now, she wants to take the next step - to live independently with her beautiful pup Willow. Specialist Disability Accommodation is housing that is especially designed for people who have very high support needs. It is funded under the NDIS. As beings of western society, we elevate our way through life by achieving some standard milestones. These milestones include graduating school, finding work and or study, moving out of home, getting married, having children. Whatever order you do these is up to you, everyone is different. However having a milestone to work toward provides a sense of achievement. As a thirty-one year old woman, I feel I’m way past meeting my next milestone of moving out of home. However before I’m too hard on myself, I have to remember that having a disability sometimes can put everything else on slow motion. Therefore, I know I have to work that much harder to meet my goals. I have always known I want to move out of home, however started to get more serious about it four years ago. As a young single woman on the Disability Support Pension, I knew buying a house was unrealistic. I thought I may be able to rent however this too become unrealistic when I realized that all my pension would be used up on rent and I wouldn’t be able to go out to enjoy life and buy what I need. The Department of Housing scheme (rent equals 25% of DSP) was an awesome solution, however the ten- year waiting list is always a deal breaker for everyone wanting Housing. Therefore when the NDIS announced they were putting a scheme in place to cater the housing needs of Australians with a high needs disability, my Coordinator of Support and I jumped at the opportunity to find out more. This scheme is Specialized Disability Accommodation (SDA). SDA was intended to meet the needs of 6% of NDIS participants, who had higher support needs. The parallel intention was to plant more accessible housing in the community. Learning this, a lot of property developers quickly joined up to be SDA providers and started to plan to build for this market. Another attraction to SDA is that it mirrors the Department of Housing scheme of only asking participants to pay 25% of their DSP as rent. The EHOP took my Coordinator of Support three months to write, it was an enormous task and took a lot of collaboration between her, my occupational therapist and myself. By February, this year, we had it ready to submit. We submitted it with my plan review as it was that time of the year. At my plan review meeting, the planner was energetic about SDA, in fact the second I walked through her door, she apologized for a minute for finishing an e-mail to the SDA team trying to get a decision. Also, she was unsure to write up my plan before getting a decision, as my supports would differ whether I was moving out this year or not. However, because of the long wait, she did end up writing my plan so it could start. I should let you know that this planner was not the person that made the decision on whether I would receive SDA or not. Rumour has it that these decisions are being made by a Specialize SDA team within NDIA, with its members scattered around Australia. I have to say I don’t like this approach as no one within this team took the time to come to meet me. Yes we did put everything we could in the EHOP, however without getting to know me and both the good and bad parts of my day, it is most difficult to make a decision about my life. Especially since NDIS structures itself on person cantered approach. On Tuesday twenty-sixth June, the planner contacted my Coordinator of Support to inform her I wouldn’t be receiving is SDA. The specialized team had submitted documentation of reasoning however we weren’t allowed to have access to this. After my coordinator of support argued that if we were going to appeal this decision we would need to know the reasoning, the planner agreed to summarize the documentation to give to us in both written and verbal form the following Tuesday. Feeling like my world had been upside down, I agreed to go to the meeting on the Tuesday. I have to say the planner was really apologetic and spoke with nothing but compassion toward me. For this I am very thankful and in no way I blame her. However, although one of my goals ever since my first NDIS plan has been to move out, the planner said SDA was not in line with my NDIS goals. Also it would not be cost effective overall and especially in the way of assistive technology. Although it wasn’t in the letter, what the planner said next angers me. The planner spoke of my intelligence and my knowledge and ability would allow me navigation to find mainstream housing. Apparently my intelligence signifies my ability to buy a house or be in the rental market. Also, it was hinted if I had an intellectual disability, the decision would be very different. This completely stunned me. With the enormous help of everyone I’m close to, I have worked so very hard to get to where I am today. Each and every day, I work toward being a better and more independent person and let you know I have only the highest expectations of myself! After thirty-one years of being this determined, only to hear I am too intelligent for a funding package which will better my life in so many ways, I have no words! The meeting continued on. The planner then went on to justify why I don’t need a fully wheelchair accessible house, to support the argument that I have the ability to get mainstream housing. Because my occupational therapist discussed my functionally and my hand control was not enough to have the ability to cook, the reasoning drew upon this, stating that I can’t cook therefore I don’t need an accessible kitchen. At this point, the planner suggested that I could sit in the kitchen door way to call out to my support worker what I need to eat. The same went for the laundry. Although my occupational therapist discussed my ability to turn my washing machine on independently, it was stated that I don’t need an accessible laundry room as I can’t do laundry. If you haven’t figured out by now, I’m big on personal growth. If I did have an accessible kitchen, I have the determination to start to do more independently. I would grow! · Even if the landlord gave me permission to make the bathroom accessible, I would not be able to move in until the bathroom was made accessible. Therefore would I have to pay rent although I’m not living there yet? This deal is unrealistic with little thought behind it. It is laughable actually! It is no way a compromise to not getting SDA. NDIS - CAN WE WAIT TEN YEARS? It has been proposed that the successful build of the NDIS will take up to 10 years. Do we have it in us to wait that long? The long awaited NDIS Provider Registration and Practice Standards have finally dropped. Here we will talk about what they mean for Allied Health and Support Coordination. The NDIS began back in 2013 with a trial in a few geographical areas across Australia. For Providers, registration to deliver services under the NDIS was subject to meeting state based rules. Incidents were investigated by state based agencies such as the Ombudsman. This means that there have been issues of consistency as well as barriers for Providers to register their business across different states. It has long been identified that there needs to be a National body overseeing the safety and quality of services being delivered across Australia. The NDIS Commission has been set up in response to this and these Standards are a huge step towards National registration and consistency. The nation will gradually transition from state based registration with NSW and South Australia to start in July 2018 with the rest of the country to follow in the following years. Providers who are currently registered with the NDIS will have their registration transferred to the National register automatically. If the National requirements are different to the state based requirements there will be a transition period with a time frame for businesses to complete these tasks. We assume that businesses registering for the first time will be subject to the new National registration requirements at the time of application. The Standards contain information about how Providers will be assessed before being approved as an NDIS Provider. This means that Participants who are funded against these items will not be able to self or plan manage these items. 7. A business that is a Body Corporate will be required to undergo Certification regardless of their registration group. 9. There will be a transition period for businesses to comply with the new requirements. This has not been defined. There are 8 Schedules which contain the specific elements that a Provider will be audited against, these will be specific to the Supports that a Provider offers. Schedule 1 and 8 seem to be the most commonly required within an audit. Businesses requiring only Verification (sole traders and partnerships not offering high risk supports) will have to provide evidence against Schedule 8. Businesses who are considered to be a body corporate and not offering high risk supports will be assessed against Schedule 1. Businesses who are offering high risk supports will be assessed against Schedule 1 PLUS the relevant specialist Schedules. Schedule 1: this is the Core component which covers the areas of Rights, Governance and Management, Provision of Supports and Support Provision Environment. Any business requiring Certification will complete some or all of this Schedule. There seems to have been some effort to make the load a little lighter for sole traders and partnerships. For those not offering any of the ‘high risk’ supports (those requiring Certification, above), the less arduous and less expensive Verification audit will be required. This requires providing evidence against Schedule 8. For those who are offering high risk supports, Certification will still be required however for Early Childhood it appears as though there will be a reduced number of elements from the Core Schedule (Schedule 1) that a business would need to provide evidence for in addition to all of Schedule 5. There are a few things that we still don't know. We don't know how much Certification is going to cost. This is a huge anxiety for many small businesses given the state based audits were upwards of $4000. There has been discussion that a grant may be available to support businesses to complete the Certification process and we have yet to see any detail on this. An approved list of auditors will be provided at some point in time, we assume when the new NDIS Commission website is up and running. There is reference in the Standards document to NDIS Guidelines (Quality Indicators) which you can find at this link. More to come on this one. We have partnered with Nacre Consulting to provide a Business Bootcamp workshop on Saturday June 16th. While this will not be entirely focused on the Quality and Safeguards changes we have dedicated a portion of the day to this topic. This event will be run virtually and recordings will be available to all registered participants. Read more about this workshop here. We have no reason to believe that there is a need to panic. There will be time for businesses to transition and to get their policy and evidence in order for either Verification or Certification. The grants will be announced to support the financial process. Let's stick together like we have for the last 5 years, support one another and we will indeed get back up again. In February 2018, the NDIS Independent Pricing Review report was published alongside the NDIS response which stated clearly that they would be accepting and implementing all of the recommendations. Some of these recommendations seem to make positive steps towards stabilizing the market and acknowledging that workers with higher skill sets are paid at a slightly higher rate when supporting a person who has more complex support needs. Other recommendations stand to make radical changes to the shape of the market as well as adding further complications to the planning process. Let’s break it down for both Providers and Participants. Before we start we would like to make the point that it is essential that both the Participant and Provider elements of the NDIS reform to be catered for. Participants plans need to accurately reflect the supports that they need. Providers need to be able to run a stable business within the NDIS rules and regulations. The NDIS needs to be able to remain sustainable. Changes to the way that travel can be charged to regional and rural areas (MM4 and MM5) areas. You can see a map of these locations here. Note that this definition is not necessarily the one that will be used by the NDIA. There is also a recommendation that the definition be finalized. The current issue: these areas often have few providers located within them however are within travelling distance for providers who come from the nearest regional city or town. However the amount of travel time which could be claimed for therapists has been limited to $1000 per calendar year with the first 10km unable to be claimed for. Attendant care workers can charge to a maximum of 20 minutes of travel time between Participants and cannot charge for the first or last visit of the day. For example: in the Hunter Valley the travel time to the outskirts of the region from the nearest cities of Maitland and Newcastle is around 3 hours which is where most providers are based. A therapist would use up the $1000 travel cap within a few visits and if this person was the first visit of the day for a support worker they could not claim for travel at all. An attendant carer could easily be traveling further than 20 minutes between visits in these areas. For Participants there is risk that they will not be able to find a provider who will travel to them; they can in reality be left with funds to spend on support but no way to pay a provider to get to them. The recommendation: the 20 minute travel cap be lifted to 45 minutes and the same rule be applied to therapists as well as attendant carers. It is our understanding that travel to the first and last visits of the day cannot be claimed. Travel beyond 45 minutes could not be claimed. The implications: This gives some capacity to better cover costs of travel for providers. However to ensure that their time is able to be claimed providers may try and schedule their first and last visits of the day close to home base which will reduce person-centredness in terms of scheduling appointments. The 45 minute limit may still reduce the number of providers willing to travel to more extreme distances especially if they can’t group a few visits within the same geographical area. Our concerns: other comments related to this recommendation: that the Agency actively reduce the incentives for Providers to travel (if there is a local option) which inherently reduces choice and control for Participants. Ideally a local market develops however there is no guarantee that services are of an appropriate quality or that they would be the provider of choice for the Participant. The Issue: Currently there is a 5.5% higher rate which is applied to plans for individual support (attendant care) where the person is deemed to have more complex needs. However there is currently no clear definition of complexity and the higher rate does not allow for ongoing training and development needs of the worker. Currently the complex rates are applied inconsistently across Plans. Providers are having to request reviews of plans to have the higher rate applied. Providers are paying staff at a higher rate than they are able to claim from the NDIS which is affecting viability. Providers do not have enough funds to train their staff. Participants with complex support needs may be finding it difficult to find providers to support them. The new recommendation is for a tiered system, including a standard rate, a rate of 5.5% higher for mildly complex needs, 10% higher for very complex needs and a quotable item for extremely complex needs. This should provide better funding for providers to train and maintain skilled staff which in turn should improve access to the right skills and experience for Participants. There is also a recommendation to apply the complexity and fee loading to group programs held within a centre. Our concerns: how complexity will be determined, what levels of evidence will be required to prove complexity, what skills will the people making the complexity decisions have, how will higher skill levels of workers be determined and proven, whose responsibility will it be to monitor worker skills and competencies, how will workers with necessary skills be able to be found. There is also a reference to the ‘categorisation’ of Participants. Yuck. The issue: extreme behaviours of concern (including Participants who are under justice system orders and previous offenders no longer subject to orders) are not specifically catered for within NDIS pricing. Providers working with people who are exhibiting extreme behaviours of concern have tended to be highly skilled and specialized with comprehensive knowledge of the legislative environment. There is a high degree of risk for workers and a degree of criminal liability if a person in a providers care reoffends. Currently the conflict of interest rule prevents a provider from offering Support Coordination as well as direct support. Support coordination is also not funded consistently at the Specialist level. The recommendation: A consistent process be developed with a quoting system for providers to enable sufficient funded support for someone exhibiting extreme behaviours of concern. Allow providers to provide Support Coordination as well as direct support. Implications: appropriately funded plans with an opportunity for provider input regarding holistic and perhaps even preventative support. Our concerns: some businesses may end up prevented from engaging in this work if direct referrals become the norm; potential for extended waiting times as quotes are reviewed and negotiated; Who will complete the quote and does the person responsible have to sign off on it, will the quoting party be paid for it; how will specialist providers be identified? Current issue: this service is funded at a standard daily rate without regard to penalty rates and intensity of support required for the person. Many services have either reduced their offer or closed altogether. Recommendation: a restructuring of the rates to include some additional funds for the extra responsibilities of a group; some guidance for charging for groups larger than 3. Our concerns: will there be some structure around how big a group can be, what the staff / participant ratio's should be and the suitability for attendance at that group? There are potential risks for someone who needs more intensive support being placed within a large group with minimal available support. The current issue: the report states that participants, providers and other stakeholders requested differentiated pricing for different services to better match market rates. Travel and cancellation issues exist for therapy support. The recommendation: That participants be categorized on the basis of complexity and that the allocated therapy price be determined against that level. The lowest rate would mean a significant reduction on the current NDIS price. There is a slight increase for supporting someone with more complex needs. Psychology rates see a slight drop for a standard referral and an increase to support someone deemed to have a complex need. There is also a slight change to the ability to claim for cancellations. Implications: the NDIS would reduce the spend on the therapy budget. Therapists would have to decide whether they accept referrals at the lower rates and if they do how they can deliver those services and ensure that their business is viable. Our concerns: the quoted ‘ comparable schemes’ are not comparable to the NDIS. The current NDIS rate IS the market rate. Therapists may de-register from the NDIS market if their business is not viable with the new rates and only see people who are self managing their Plan. Participants will be further ‘categorized’ which will likely require more assessment and evidence and further label them. The skills and knowledge of the people determining complexity level may not be sufficient. Choice and access to providers may become very limited. The current issue: the NDIS is trying to reduce the therapy budget by using less qualified workers to carry out the work. The report states that this could provide better value for money. The recommendation: there be two levels of pricing for therapy assistants. One level for a support worker type role whereby the assistant is supporting the delivery of therapy services within a capacity building framework. Level Two would involve a qualified therapist completing a ‘treatment plan’ and a consultation would then be carried out by someone more qualified than a support worker but less qualified than a therapist. The implications: people would receive their therapy support from someone other than a therapist at a lower cost to the Scheme. This could be used efficiently to make a therapy budget go a little further. It is possible however that if this is funded on a line of it's own it will be funded with a capped of number of hours just as therapy is now with no guarantee that this will mean additional opportunity for therapy input. So that kind of sums up the key points from the Independent Pricing Review. To let the NDIS know that you want to be involved in the upcoming consultation email marketandsector@ndis.gov.au by Saturday 14th April 2018. Why are you pushing all of your therapy providers away? We started this new exciting story with you in 2013 with hope in our hearts for a better future for people with disabilities in Australia. We wanted to be a part of that story. We brought our many, many years of skills and experiences of working in the disability sector. We knew the old system wasn’t working. We knew the length of the waiting lists. We knew that some people were going without. We so hoped that the NDIS would mean an end to all of that. Many of us had originally fallen into the sector by accident – and found our passion and satisfaction for supporting people to reach their potential regardless of the challenges they faced. We attended thousands of hours of training and development. We read hundreds of research articles and went along to conferences. We endeavoured to know about the best, latest techniques and equipment. We learned to be person and family- centred. We learned about the International Classification of Function and Disability which encouraged us to move away from a medical model to an inclusive, participation model which saw us leave our clinics and target practical solutions where people actually live, work, study and play. We celebrated successes with the people we supported. We became frustrated with ourselves when we couldn’t find the answers. We cried at the funerals of those we lost along the way. We launched ourselves into the NDIS with a nervous but enthusiastic energy. We wanted to take our learning and experiences into the new world. We wanted to see the people we support achieve their goals. We wanted to stay. NDIS started out with such promise. Hopes, dreams and aspirations for Participants. Well funded Plans meant plenty of work for everyone. This new environment looked filled with promise for everyone. Job creation, new businesses, choice for Participants. It didn’t take long for the wheels to start to wobble. Our colleagues in government positions were in a two and a half year limbo waiting to find out what would happen to their jobs. Many of them stayed. Our non-government colleagues entered a world of billable hours and interventions dictated by a strictly budgeted number of hours. Their managers frantically tried to make the numbers work. Often they couldn’t. But many of them stayed. NDIS budgets were tightened. The funding bucket is not bottomless. We got that. We worked together with Participants and families to make it work. We stayed. The rules changed. All the time. Without notice. Often we found out about the changes by tripping over them on the website or happened to be talking to another provider. We adjusted. They still change. All the time. We keep adjusting. We stay. The payment Portal crashed. You blamed our inability to use it properly. We survived months without pay by taking lines of credit, maxing out our credit cards and re-mortgaging our homes to pay our staff. We looked after each other. We got through it and we stayed. Your representatives insult and disregard our professional opinions. They tell our clients that we are greedy and that they should find a student to deliver their services instead. They don’t take the time to ask us for more information or clarify our reports. In spite of this, many of us have stayed. It became impossible to have questions answered. Our enquiries go off to Planet Escalation never to be seen again. Hours are spent on the phone and email. We created our own online communities to access information from each other. This has helped many of us to stay. We began to farewell our colleagues who were burned out and over it. Many left for other sectors taking decades of experience with them. Some of us still stayed. We watched our friends businesses crash when a new interpretation of a principle or rule stripped funding without notice from the Plans in the specialist services that they offered. We rallied around them and fought for their business. They have not stayed. You decided that regardless of how many thousands of hours we have spent with babies and small children in the past, regardless of the fact that we STILL spend hours with babies and small children who are not NDIS funded, regardless of our professional registrations, regardless of the police and Working With Children Checks, we STILL require a $4 000 + audit to be able to continue to do so. Our Behaviour Support practitioners and Support Coordinators face the same reality. How many can afford to stay? You have now accepted the recommendations of your Independent Pricing Review to grade Participants on the level of their ‘complexity’ which in turn will affect their therapy funding. The ‘less complex’ Participants will be funded at almost 40% less than the current rate. What seems to have been missed here is that people have to have a disability that is already showing a certain degree of ‘complexity’ just to be eligible for the NDIS. Unlike the noted ‘comparison’ schemes such as Worksafe, Veterans Affairs and the Transport Accident Commission. We are not sure how people with disability feel about being allocated a ‘complexity’ level. We are not even sure what ‘complex’ will mean. We don’t know who will be responsible for making the decision or what hoops the Participant will have to jump through to establish it. We only know that they will be implementing this when the new price guide starts, in just 10 weeks time. We know how this will play out. Our professions are being devalued. Our businesses will no longer be viable. It's going to be incredibly difficult to stay. Choice could be a thing of the past. While the economic cost of this reform is constantly being reviewed, it’s the emotional cost that is completely and utterly out of control. Here is the link to the Independent Pricing Review and the NDIS response. In what can only be described as an effort to shift costs from the Commonwealth funded NDIS to the individual states the NDIA have decided to cease funding the assessment of swallowing disorders and the creation of the Mealtime Management Plan. Their reasoning seems to be that as this assessment and Plan are developed to prevent health complications, the state based Health systems should be the ones who complete this work. In most places, people who have permanent and long term disabilities which cause swallowing disorders have been supported by professionals in the disability sector. We have been unable to speak to NSW Health to determine whether they are ready to take referrals for these assessments and how we can start to make those referrals without delay, given that the consequences of people having to wait can be catastrophic. This is yet another decision of this reform where front-line staff and people with disabilities are left assuming has been based on budget, with little to no discussion with the people who actually do the work or experience the disability or with regard to how this affects the marketplace and the additional challenge of coordinating services for people who are more and more often being broken up into body parts. We are putting together a perspectives paper collecting a range of stories from both providers and participants on how this will affect people with disabilities and the sector in general. If you can help please click through at the end of the article. It’s hard to argue that there are many areas of support more important that the supports to a person with eating and swallowing challenges at mealtimes. Recently Speech Pathology Australia announced that their conversations with NDIA have confirmed the rumours that we had been hearing for some time – a decision had been made to cease funding support for the development of Mealtime Management Plans because in their reasoning, this is the responsibility of state based Health services. We have not been able to establish as to whether the Health systems have a process in place to pick this work up or whether they have the capacity to complete assessments in the persons home rather than in a clinic or hospital which is best practice for people with complex disabilities. Cue #NDISeyeroll followed by #NDISfreakout by, well, everyone involved with people who have swallowing disorders, including the people who have swallowing disorders. Let’s take a look at why and how you might be able to help us lobby to have this decision reviewed. Swallowing is a reflex controlled by the brain just like breathing and your heartbeat. When food, drink or saliva is gathered together and pushed towards the back of your mouth your brain sends the message to the muscles of your throat to do their thing to safely pass that ‘ bolus’ from your mouth into your food pipe (oesophugus). The food pipe is right next to your airway. So it's easy to see how if something is going wrong, things can go pretty badly, pretty fast. These swallowing movements are carefully coordinated and timed and when they don’t work together in the right way or with the right timing, small amounts of food, drink or saliva can slide into your airway (trachea) instead – usually triggering a huge coughing fit, watery eyes and a sharp back slap from someone close by. Coughing is essential because it acts to catch that food, drink or saliva and move it back up into your mouth where you can spit it out or try swallowing it again. The last thing you want is for it to keep going down your airway because then it can end up in your lungs. There it can cause infection, pneumonia, long term lung scarring and in worst -case scenarios, death. It’s worth remembering that we swallow all day every day and night – just as we breathe and our heart beats all day every day and night. So if something is going wrong it affects your whole entire life, even when you are sleeping. Here is a nice easy to understand video which explains how food can ‘go down the wrong way’. A swallowing disorder is called dysphagia. Dysphagia can relate to challenges with mealtimes from the time that food enters the mouth to the time that the food is swallowed and safely lands in the stomach. A dysphagia assessment will consider the persons ability to take the food from the fork or spoon into the mouth, chewing, moving the food around the mouth and to the back, the speed and coordination of the swallow, any reflux or regurgitation, the persons positioning and seating, any dietary considerations and any behavioural challenges that might be contributing. A dysphagia assessment will usually be done by a speech pathologist. Sometimes other professionals such as dietitians, occupational therapists and psychologists may also support the process. A special test, like a moving X-Ray, is called a modified barium swallow test which can show whether a person is swallowing safely. Here’s a video from YouTube showing what this XRay looks like. Dysphagia can cause a number of health problems. These include weight loss, choking, chest infections, pneumonia, low oxygen levels, fatigue, diet related illness, dehydration and as we’ve already said, death. Dysphagia also causes a number of other challenges, especially affecting a person’s quality of life. If a person is having trouble eating and drinking, or coughing all the time when they eat and drink – it makes it much harder to eat out, much harder for someone to support them, can lead to social isolation and mental health disorders such as depression. Can you imagine feeling as though you are drowning every time you have a drink? A person experiencing dysphagia also presents more risk to a provider. We don't feel very comfortable raising that issue - but there are already reports of people who present with high risks finding it harder to purchase supports. Dysphagia can be caused by a number of factors including physical disability, degenerative disease, brain injury, intellectual disability and ageing among many others. Dysphagia occurs when the food, drink or saliva cannot be safely taken into the mouth, chewed, swallowed and digested in the expected way. The most recent NSW Ombudsman’s report of reviewable deaths (with a new one due out imminently) reveals that 25% of deaths of people with disabilities who are in care are caused by respiratory complications. This includes several incidents of choking and aspiration pneumonia. Many of these deaths are preventable and are often a result of a Mealtime Management Plan not being followed. Frighteningly, several people die every year of choking on their birthday or other celebratory day. An assumption can be made that a well meaning family member or carer has decided to offer the person some sort of treat – or the treats have been made available to the person in some other way by accident - that does not conform to the recommended texture or consistency detailed in the Plan. This does not include the poorer mental health outcomes experienced by people who become isolated as a result of their swallowing issues, nor does it include their levels of physical discomfort or loss of other skills caused by their ongoing 24 hour challenges with swallowing. What is a Mealtime Management Plan? A Mealtime Management Plan is the plan that is worked out with the person who has the swallowing challenges. It contains strategies for how to manage the swallowing issues with the main idea of keeping the person safe, comfortable and healthy but also to ensure that the person is experiencing the best quality of life possible and participating in all of the activities that they choose. The Mealtime Management Plan for people with complex and / or multiple challenges often has input from a variety of professionals. A dietitian will look at the nutritional aspects; the speech pathologist will look at the physical act of eating and swallowing; the occupational therapist will look at seating and positioning and a psychologist or behavior specialist may contribute if there are challenges in these areas too. The people who develop the Mealtime Management Plan would also support the people who are supporting the person with the challenges at mealtimes to understand how to best support them. This can mean providing a particular texture or consistency of food and drink, assisting the person to sit in the best position, provide the right equipment and utensils and teach them how to ensure that the person is participating in the things that they enjoy to the best of their ability. In the end the person should have a clear Mealtime Management Plan that covers all the challenging issues and that enables them to engage in mealtimes – and life - safely and comfortably. Where do people go to get a Mealtime Management Plan? Up until now, this depended a little on the circumstances of the person with the swallowing challenges. Like many professions, people have tended to specialize in particular areas. Many professionals in the disability sector have supported people with disabilities with their mealtimes over many years. They have developed many skills through extra training and learning; they understand and account for the specific challenges for people who have long-term complex disabilities and their families and carers. Professionals in the Health system also have highly refined skills. Their specialization varies depending on which part of the Health system they work in. Generally they offer amazing support to people with swallowing difficulties while they are admitted to hospital and sometimes specialist teams within the Health system would support people who have specific conditions. Traditionally a person with a long- term disability would be referred to a disability specialist provider. Rural and remote areas may be exceptions where access to services can be limited. When a person is experiencing mealtime challenges and these are not well managed, there are some pretty predictable and terrible outcomes for the person including serious illness, reduction in participation in the activities that they like and enjoy, risks for the support team around that person, mental health challenges and even in come cases, death. Let’s remember that many NSW Health professionals are very good at this work – so if they are ready with referral systems, have trained up their staff accordingly and have capacity to do the work – everything might just work. We have no indication that any of this is in place. Looking coldly at the costs when things go wrong in terms of money, when you consider the possible trips to the GP, emergency, possible ambulance trips, admission to hospital or the ICU, then the ongoing cost of care and support if long term health problems result. Of course these costs are all borne by the state based health systems rather than the NDIS. However an increase in the level of disability which can result from chronic disease or acute illness is likely to result in higher ongoing support needs which will impact in higher NDIS plans. Any provider who is supporting the person will carry the risk of someone in their care becoming gravely unwell. And let’s not forget the emotional cost for the person and their family. Now we get to the risk for the marketplace. A number of businesses specializing in this work have already started up and established themselves in the current NDIS market, many of these professionals have left other positions to take their skills and experience into their own businesses. These businesses are now at risk of closing. There are non-government organisations who also have recruited staff who are skilled and experienced with this work and also stand to take a hit to their income if this work is redirected to Health. If this decision is maintained and the Health system are expected to pick up the creation of Mealtime Management Plans we are going to have a serious coordination issue on our hands at the very least. If a person requires support for both swallowing and communication – which is common- they are likely to need two separate speech pathologists. If an OT from Health determines that a seat needs to be modified or ordered to ensure safe eating – who prescribes and pays for that? How is this coordinated with the person’s other OT who is managing their other related disability needs? Who trains the support team around the person? NDIA are suggesting that they still fund this, however this would mean that it is likely that the person who trains the team would not be the person who writes the plan. In a sector where we are already in the red zone when it comes to workforce skill and capacity, this decision stands to actively block the person with the swallowing disorder from accessing the professionals with the most experience for their particular situation. Let’s be clear. There is nothing INDIVIDUALISED, or PERSON CENTRED or even SENSIBLE about this decision. We are trying to gather information about how this decision will affect all stakeholders with a view to creating a Perspectives Paper. We would like to hear from Providers both non-government and private and Participants, and would love to hear from NSW Health too. Your contribution can be anonymous. You can get started by clicking this link.